I’ve said it before and I’ll say it again . Easy and quick recipes delight me and even more when they are simple to make and packed with good taste . So when it came to this weekend I wanted a simple and quick go to baking recipe that I could whip up in no time and voila ! I immediately thought of choux pastry and thought it had been a while since my last attempt at getting it right at home. And honestly, I’ve tried choux pastry a couple of times before and failed in a couple of more. 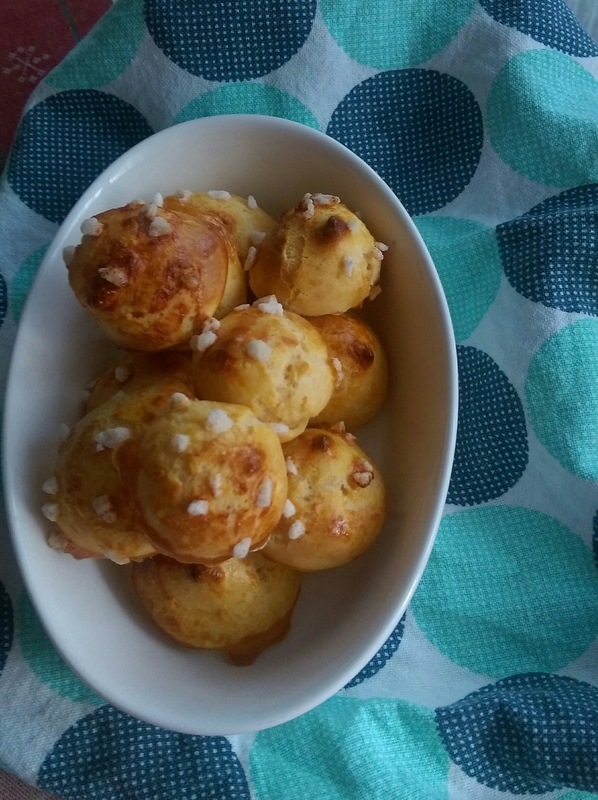 So last evening I came across the most authentically French recipe of these tiny sugar puffs called chouquettes otherwise and my verdict is ‘fail proof’ for the recipe. Pastry making couldn’t get more simpler and French than this ! 1. Pre heat your oven to 200 ℃ and prepare your baking tray lined with a greased baking sheet. 2. In a saucepan on medium heat, add butter, milk, water and a pinch of salt. Keep stirring until it simmers and take off from the heat immediately. 3. Quickly add the all purpose flour all in one go and stir vigorously using a wooden spoon until the mixture comes together all in a smooth dough. 4. Keep dough to cool until room temperature. Add eggs to this one at a time. Since the eggs I had were large, two eggs were just enough. Stir until well blended with the dough. 5. Cut a small tip at the end of a piping bag and pour in the dough. 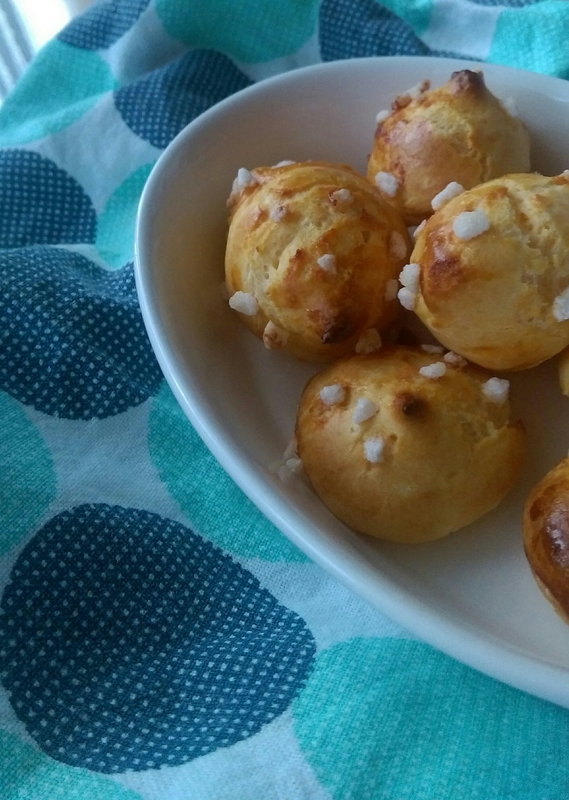 Pipe out little circles on a baking sheet, keeping enough space between each pastry puff. Egg wash each puff gently and sprinkle sugar pearls on each. Incase you don’t find yourself sugar pearls, I’m guessing white sugar granules would do as well. 6. Bake in the oven at 200℃ for 15 mins . As soon as its done baking,remove from oven and while still warm using a skewer poke each puff to allow the steam to escape. 7. Store in air tight containers overnight if required. Until my next bake post, Happy Baking! Looks so cute. Thanks for sharing! Thanks for this post. I’ve enjoyed reading so many of your posts as a subscriber to your blog. I’m wondering if you’d be willing to become a regular reader of my blog: http://christinanifong.com. I’d love for you to follow along on WordPress.com and/or sign up for my weekly email newsletter here: http://christinanifong.com/2017/04/stacking-up-a-satisfying-salad/. The signup box is on the righthand side. Thanks for considering!